Even more than his bravery, we see Meirelles' dedication. In his meetings with the previously contacted and settled riverside tribes who live closest to the isolated communities, we see some of the thorny practicalities entailed by FUNAI's approach. 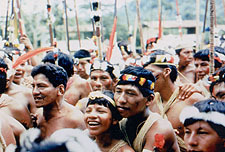 After a number of conflicts and thefts involving the 'wild' Indians, with casualties on both sides, Meirelles must propose possible solutions for peaceful coexistence, offering concessions on behalf of the government to the contacted indigenous communities that have suffered the greatest losses. Director of photography, Dante Belluti; editing, Joana Collier; music, Edson Secco.